Well, it's unanimous ... everyone adores this gorgeous fabric! It was bought to cover the serving tables at a baby shower. What a cute idea, right? When I was asked to make them I thought, "Super-cake!" Then, when the ginormous 57-inch by 240-inch piece of fabric was delivered I thought, "Holy crap!" Working large-scale has it's own unique challenges just like working in teeny-tiny-scale. But I figured out a great way to easily do the hemming, so even though it wasn't super-cake, it was still cake. And who doesn't love cake?! Once I trimmed the huge-o piece of fabric into two tablecloth-sized pieces (thank goodness for the rotary cutter! ), it was time to figure out how-in-the-world to hem the edges. I sat there staring at the edge ... I knew I couldn't be fussy and do my normal "fold over the edge measuring as I go, iron, fold the edge again, iron, and then sew it" thing. 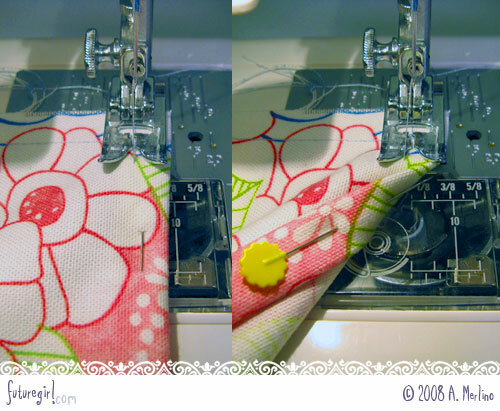 Then, as I stuck the fabric in the sewing machine to just "do something" I had an idea ... why not just sew a line half-an-inch in and use that as the fold guide. So smart! I'm so glad I thought of that before I started sewing a bunch of stuff I'd just have to rip out. 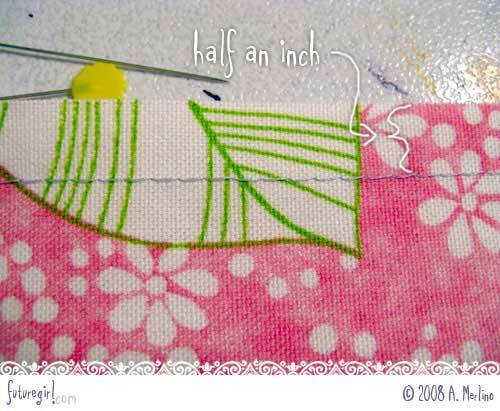 (1) Sew along the edge half an inch in from the edge. 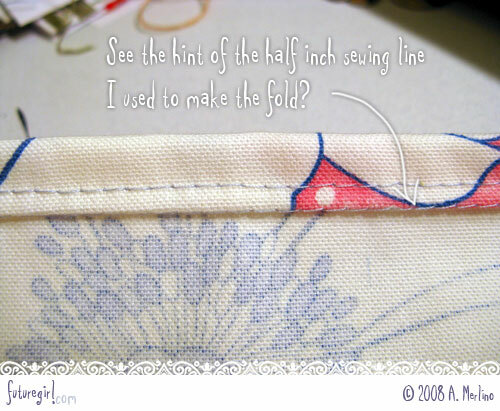 (2) Use the sewing line to fold the fabric over half an inch. 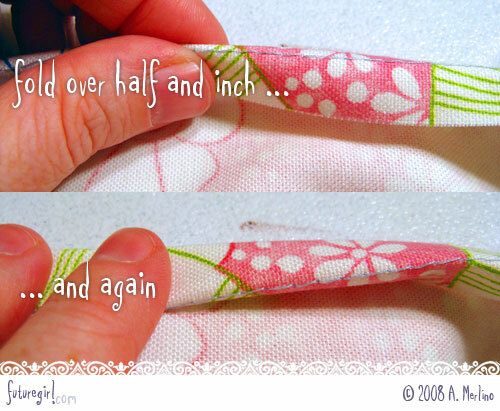 Then fold that over again another half an inch. (3) Pin! 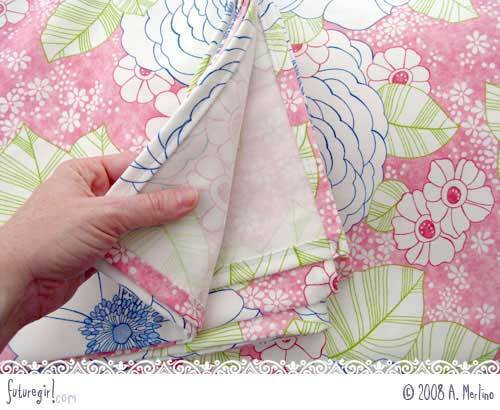 The fabric should be wrong side up with the bulk of it away from you, like in the picture. 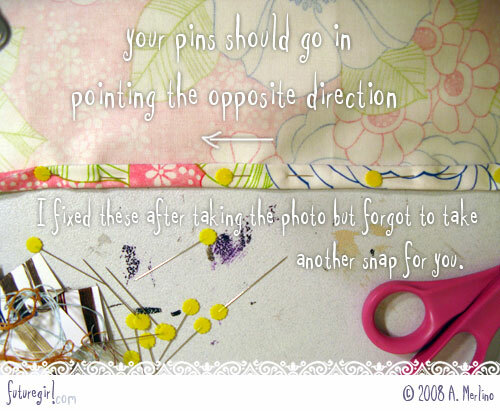 But your pins should be in the other way. When they are in the right way, they'll be easy to pull out from underneath of your hem as you sew. (4) See? When you're pins are in right you can pull them out. Or forget like I did a couple of times. My sewing machine went right through the plastic heads like they were butter. I love my sewing machine! 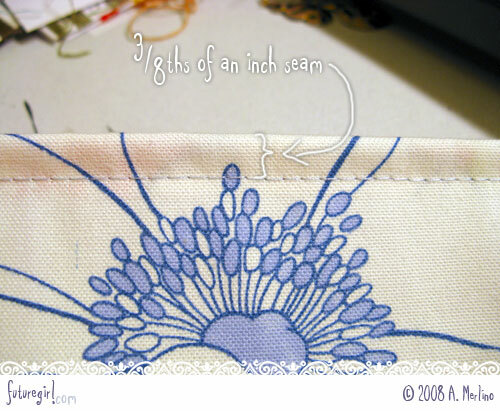 Sew a 3/8-inch seam. (5) Here's the back side of the sewn hem. All the raw edges are contained in the hem. You can see the edge of my initial sewing line, but it doesn't look bad. (6) And, finally, here's the front side of the seam. Yay! This system made quick work of this project, and that's saying a lot when you figure that I sewed almost 56 feet of hems. That's almost nine yards! Wow. And the best part of this project is that they will have all this amazing fabric left over after the baby shower. Imagine all the fun stuff you could make with it! I keep imagining the cutest set of reusable grocery bags. Shopping in style! I tried to find it online so I could link to it, but I had no luck. The edge says P/Kaufman, but that's it. If anyone knows what fabric it is, let me know because I'm sure people are going to email me and ask. It's a heavier weight cotton that has a stain resistant finish on it.